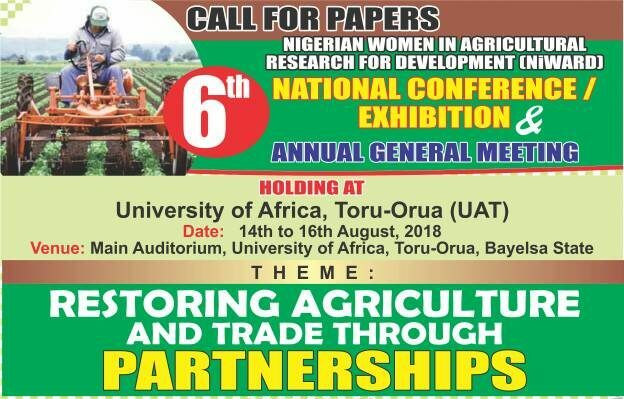 The Nigerian Women in Agricultural Research for Development (NiWARD) held her 6th National Conference/Exhibition and Annual General Meeting at the Honni Hills Hotel, Yenagoa from 14th to 16th August 2018 with the theme: “Restoring Agriculture and Trade through Partnerships”. Participants were drawn from the Academia, which include AWARD fellows, mentors, mentees, as well as Farmers, Feed Producers, Food Processors, Civil Servants, Non-Governmental Organizations, International Community, Marketers and Students. The Conference was declared open by the Acting Vice Chancellor, University of Africa, Toru Orua, Bayelsa State, Prof. Valentine Aletor, under the Chairmanship of the Pro-Chancellor of Niger Delta University, Wilberforce Island, ably represented the Vice Chancellor of the University, Prof. Samuel G. Edoumiekumo. The keynote address was delivered by the President of African Development Bank (AfDB), Dr. Akinwumi Adesina, ably represented by the Director, Human Capital, Youth and Skills Development, Ms. Oley Dibba-Wadda. AWARD Communication Manager, Dorine Odongo, presented the AWARD’s 10th Anniversary message, while goodwill messages were presented by the Founder of NiWARD, Prof. Stella Williams, Dean of Faculty of Agriculture, University of Africa, Toru Orua, Prof. Samuel Agele and Dean, University of Jos, Nigeria, Prof. Georgina S. Mwansat. Scientific papers on different sub-themes of the Conference were presented at the Technical Sessions. Also, in the plenary session, Mr. Doodei Week, the Honourable Commissioner of Agriculture and Natural Resources, Bayelsa State, presented an overview of accomplishments of Bayelsa State Government in the development of Agriculture; all geared towards increased food production, income generation and improved livelihoods. In addition, during workshop sessions, Mr. I.R. Obubo treated “Gender Inclusiveness in Agricultural Research”, while Dr. Ebinimi Ansa and her team handled Literature searching and reference managing. At the end of the Conference, the participants agreed to henceforth emphasize a business approach to agriculture production. To achieve this, participants concluded that there must be value addition to the Agriculture Value Chains of supply and the willingness of Government at various levels to focus on investing in the agricultural sector of the economy. Participants, therefore believe that the academia should start to partner with the business sector, to achieve better results. Participants also reaffirmed the importance of NiWARD members serving as mentors to non–AWARD fellows in Nigeria with the aim of bringing about the plan of AWARD for empowerment. Conferees, however, expressed concern over the quality of some research presentations during the Technical sessions and re-emphasized the need for research to be simple and impactful to the Society. Participants resolved that 2019 NiWARD National Conference be held in Zaria Kaduna State. Participants expressed satisfaction with the Local Organising Committee (LOC) for a successful Conference and appreciates the various sponsors, especially the management and staff of the University of Africa, Toru Orua, Bayelsa State for their hospitality, Ministry of Agriculture and Natural Resources, AWARD, Ministry of Information and Topfeeds for their support.